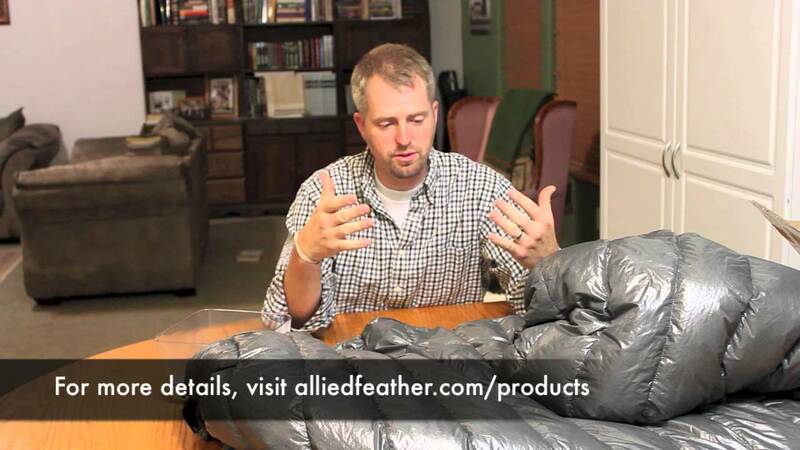 A few weeks ago, Underground Quilts (UGQ) got in touch with me to do a review of their quilts, specifically their Flight Jacket top quilt. I went back-and-forth with Paul to select the fill and finish of the quilt as they wanted to build a custom quilt for me. The attention to detail is evident in the finished product: the stitching is exacting, the material is comfortable, and even the sewn button hole for the cord lock at the head end is a nice touch. This quilt is designed for more than just hammock campers. The pad clips that run down each side help convert this quilt to ground sleeping. Thru hikers or other weight-conscious backpackers will want to look at this quilt as they compare their options. UGQ uses a standard cinch-style closure for the foot box and six plastic snaps to form the box. UGQ promotes the illume15 fabric, a lightweight and down proof 15d 0.9oz DWR ripstop nylon, with their quilts, but they offer other options (and colors) when ordering a quilt. According to Paul, they worked with International Down and Feather in Salt Lake City to have the illume15 fabric independently tested. My inspection of the quilt confirms these claims as I found no down poking through, even after some “abusive” packing and smashing. Another feature that sets UGQ’s quilts apart is the use of DWR-treated down. Water-resistant down is trending with outdoor manufacturers and I’m glad to see a hammock-specific quilt set following suit. Down fill—while arguably warmer, lighter, and less dense as synthetic options—typically collapses and is rendered useless if it gets wet. The DWR treatment give some reassurance that the insulation will perform better in wet conditions (e.g., survive a night with thick condensation from a rolling fog), although care should always be given to keep the insulation out of pouring rain. With temperatures already hitting 30°F (-1°C) here in Flagstaff, I’ve got to do some quick testing in order to take advantage of the Flight Jacket’s 40°F-rating. I’m looking forward to putting the Flight Jacket through its paces this fall! Disclosure of material connection: The author (Derek Hansen) was provided with a free sample from the manufacturer for testing and evaluation purposes. The comments in this post (written & spoken) are of my own opinion, which I formed after personally handling the quilt. Do you think this top quilt can act as a bottom and top warming piece of gear? It seems like it because this quilt can wrap around the whole body. I am looking to slash some weight and I think this can be the ticket instead of buying a bottom and top quilt for my setup. Just as a side note, I do not camp in weather below 20 degrees F.
A lot of top quilts can also be used as bottom quilts. If the quilt can be opened up and cinches on the head and foot end, then all you need is some shock cord tied on the ends to hold it up. The Jacks R Better quilts are all designed to do this. One question: Do you recommend using an over quilt as opposed to an equally rated sleeping bag (assuming you would use both with an under quilt)? I am looking to purchase one or the other, but don’t have the funds for both. 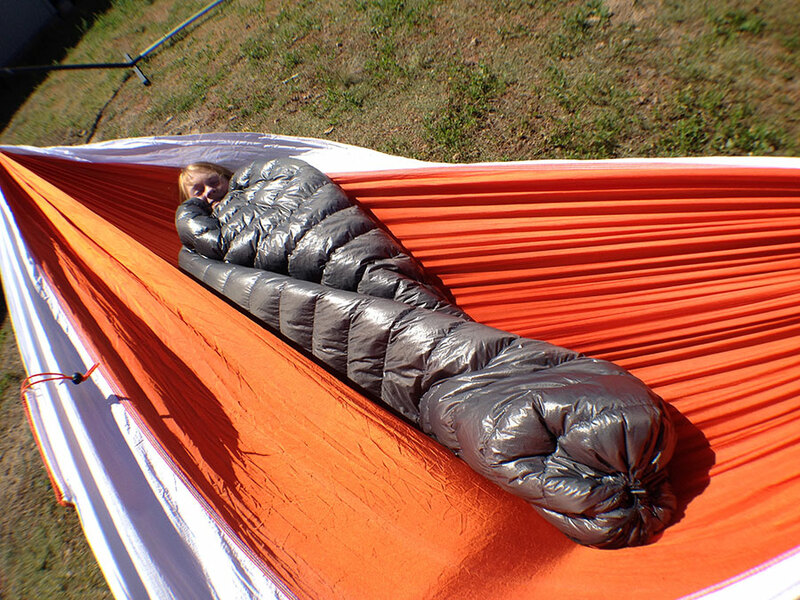 I was thinking the sleeping bag would be a smarter choice as it would find more use beyond hammock camping, but you also stated that this TQ could easily be used for ground sleeping. What are your thoughts? You have great reasoning. 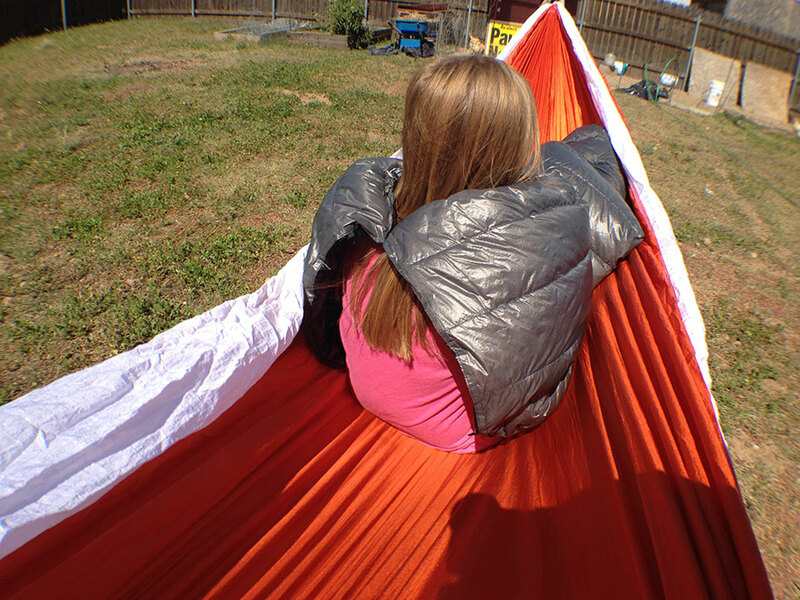 When I began transitioning to a hammock system I did the same thing, relying on a sleeping bag. However, the more I hammock camped, the less I slept on the ground, and using a top quilt was much easier to use. You also save some weight with a top quilt. Top quilts can be used on the ground, but it takes some effort to eliminate drafts. This is more of an issue in cooler temps and if you toss and turn on the ground. I wasn’t really thinking about using a sleeping bag for ground camping (I’m an orthodox hammocker nowadays), more or less just for times when you need something warm to sleep in and you’re somewhere without adequate cover. Thank you for your input, I’ll think it through. I have a sleeping back with two zippers that run along two sides. Would it be a good idea to use it as a top quilt only or open it up like a tube around the hammock?